Digital gaming is expected to reach its crescendo with the ubiquity of smartphones, the constant progress of the gaming business model, and the rising popularity of eSports. Netscribes predicts that the digital gaming market is expected to reach US$ 272.24 billion by 2022. Evidently, the global digital gaming market is one of the most booming sectors of the global media and entertainment industry. 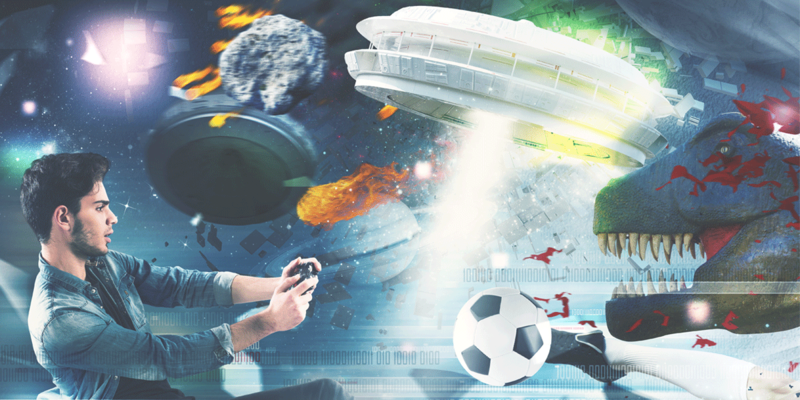 The global digital games market is a highly fragmented market with over 200 companies with revenues over US$1 million in a market of nearly US$100 billion. 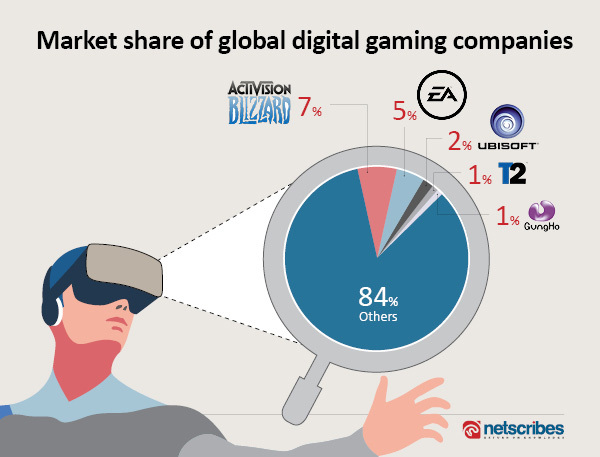 A quick look at the current competitive landscape and you will find that there are ten major gaming companies viz., Activision Blizzard, Electronic Arts, Take-Two, Ubisoft, Zynga, Nintendo, GungHo Online, NCsoft, Sony, and Microsoft. Activision Blizzard holds the largest market share at around 7%. A major revenue contributor in digital games is China, where almost 93% of the money spent on games goes to titles developed by small China-based companies. Often, these companies cannot be tracked. The top companies have a market share of 16.03% with Activision Blizzard occupying the largest share at 7.04%. Leading the pack with the largest market share at 7%, Activision Blizzard, founded in 2008 in Santa Monica, California, has several popular game titles under its belt, the most popular being Call of Duty and Candy Crush. It is looking forward to creating a brand name for itself in the most important segment: mobile, by following inorganic expansion, via the acquisition of King Digital. The company is also increasing its digitally downloadable content to leverage subscription fees, from popular game titles like World of Warcraft. Following at second place with a market share of around 5%, EA, founded in 1982, in California, has FIFA, Star Wars, and Medal of Honor, as the most popular game titles under its wing. To ensure long-term growth, EA looks forward to implementing an ‘engagement driven strategy’ and leverage the digital space to drive profitability. EA believes in growth in business through diversification and inclusive playing. It introduced women soccer players for the first time in 2016 in its FIFA series to attract female gamers around the world. At 2%, Ubisoft, founded in 1986, in Rennes, France, has Assassins Creed, Watch Dogs, and Far Cry as the top-selling game titles, all fairing successfully amongst gamers across the globe. The primary growth approach for Ubisoft is product development by refurbishing older game titles on a regular basis and also by coming up with new titles across different platforms so that existing, as well as new gamers, find innovations every time they play. T2’s Grand Theft Auto and Max Payne, among the other famous games, still holds a critical 1% share in the digital gaming world, which is significant for the company that was founded in New York, in 1993. The company is focusing on product development and eSports at the same time. They invest heavily in building high-quality game titles based on internally-owned and developed IPs. It is their strategic decision to further develop their earlier amateur competitive tournament games for NBA2K16-17 and also launch NBA 2K eSports League. Founded in Tokyo, Japan, in 1988, GungHo holds 1% along with its American rival, with popular games like Puzzles and Dragons and Ragnarok Odyssey, to name a few. The company is focusing on consumer upselling by improving existing features in ‘Puzzles and Dragons’. The company is also focused on investment in Virtual Reality and Artificial Intelligence to improve end-user experience. The digital games market is further segmented by platforms such as PC, mobile, and console. Among the three segments, mobile gaming is the largest segment and is expected to grow significantly in the next five years. Some of the key factors that are driving these trends include revenues derived from advertisements, affordable mobile phones in emerging markets, increased use of the internet and reduced or low entry barrier costs in digital gaming. Apart from a few challenges, the rapid changes in technology, the increased entertainment consumption behavior of gamers, and new and improved business models are reasons for the staggering growth of digital gaming companies. The adoption of the new digital distribution business models is quite a necessity for the companies’ existing/ planning to enter the market, to survive disruptive innovations and to acquire a sustainable competitive advantage. Looking for more market and competitive intelligence on the global digital gaming industry? Contact us.